One of the methods to earn money online is by using Facebook. This social network offers plenty of ways to make our income grow. In this article we’ll try to show you how to earn good money fast with Facebook Page. We will present you tips on how to pick the subject, which points are important when creating a Page, what strategy to use to get a lot of followers and what to serve them to start earning on it. Let’s begin! What subject matter should my Facebook Page have? While picking the niche remember that it doesn’t have to be unique, but it should be precise enough. That way, it will be clear to the casual visitor. Maybe you’ll create a Page for dog lovers, travellers or just a funny site? Consider to create a Page which will reflect your hobby. If you’re interested in Manga, fast cars or cats yourself, chances you can be expert on this field are high. Use your knowledge, observe yourself as a recipient of the content you’ll post and try to find the best one. It’s not difficult and Facebook Page Creator leads you through the whole process. For us, users who want to earn money with Facebook Page, 5 factors will be important in order to create a page that will help you boost your monthly income. Choosing the category of your Page. Depending on what you decide to publish: business advices, funny viral videos, exciting photos or stories, etc. you have to categorize your Page. There are 6 categories, so think what kind of content you’d like to post and decide which one of these categories it matches the most. Filling in the “About” section. You can present yourself to the community, you can promote your site and prepare your visitors for the kind of content they can expect if they give your Page ”Like”. It doesn’t have to be a long description. It’s best when you choose to write only 2 or 3 sentences, but try to present your main idea, try to promote your content in it. You can even write a few versions and then decide which one is the best. Cover Photo: use the cover photo to attract visitors to your page. If you want to create something extra, try Canva, it will help you to make great, customized cover photo, colorful graphics for the post and much more, all in dimensions ready-to-use on Facebook. Publishing the content: start to populate your Page with the content before you invite anyone. Make sure that people who visit your Page will see something interesting. It will encourage them to give your Page “Like” and wait for more worth-to-see posts and pictures. HINT: If you’re planning to promote your content also outside the Facebook, make sure you use the same photo on Twitter, Flickr, Youtube channel, your blog, etc. It will make it much easier to recognize you and your work. 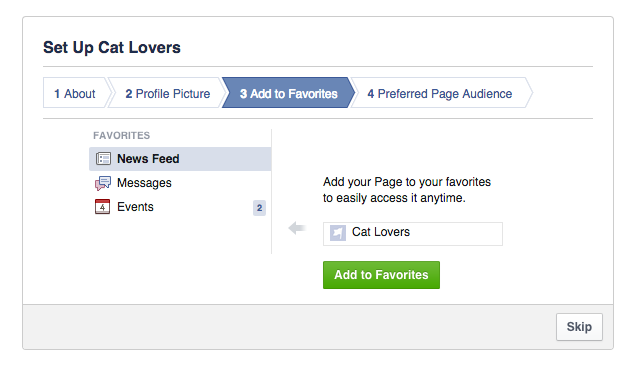 In order to get easy access to your Page, add it to Favorites in your Facebook profile! Posting the content: what and when? Okay, you have filled in the information on your Page, you have chosen your Profile Picture and your Cover Photo. It’s time to post the content! Publish the information that is relevant to your audience, for example, if you choose cat lovers, post everything related to them. They will like and share the content more often! Your fans engagement will help your community grow. It will help your edgerank score. Besides, it’s very likely, friends of your fans will see your Page and like it as well. Neil Patel has published an article with a fabulous infographic on Quicksprout . You can see what kind of content is more likeable than other and why. This great how-to infographic will help you to get more Followers and Likes. Automate your post. You don’t have to automatize everything, but it’s important to catch the rhythm of posting frequently. Try dlvr.it to automatize post you get from popular sites in your niche. Meanwhile, think of infographics, pictures or texts you can produce yourself and create a schedule for posting it. As we mentioned earlier, organizing your work is very important. Don’t forget about the possibility of re-posting your content. So you’re out of ideas and don’t have any content scheduled for the next posting. Don’t worry, try to re-post the information you already shared. If the content is still relevant and got people interested at the first time, it will probably get them interested again! Find the best time to post on your Page. Watch out for timing. Make sure that a lot of your fans are online while you publish the content. Look to Facebook page’s Insights, under “Posts”. You will find there the information about optimal posting time for your audience. HINT: It’s good for your page to post the content from famous sites. It’s very likely that Facebook will rank it better. What Should I Do To Make The Audience Grow? Organize your work well. Plan the order of activities you have to do in order to make it work for you. No matter which of the strategies you try, it’s important to have things scheduled. Add new people every day. To make your audience grow you have to increase the number of people looking at your page constantly. Use Addmefast. This intuitive service is really useful to gain first Likes and Shares for free. 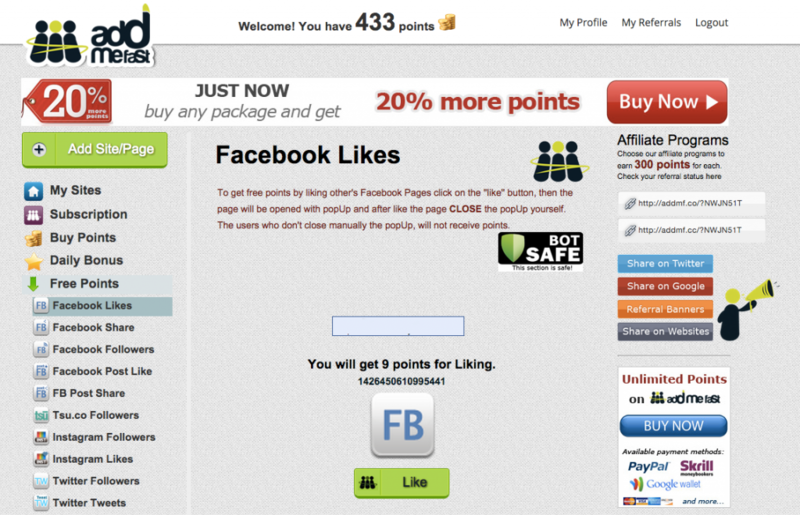 Just login, add your Facebook Page and get free points. Only a couple of minutes daily can give you good results (I clicked myself 433 points within 5 minutes). If your Page has a lot of likes it will be easier for new visitors to like it. Post the link to your page everywhere you can. Use online forums, send emails, add it to your Website (or look for people who offers adding it to their websites). 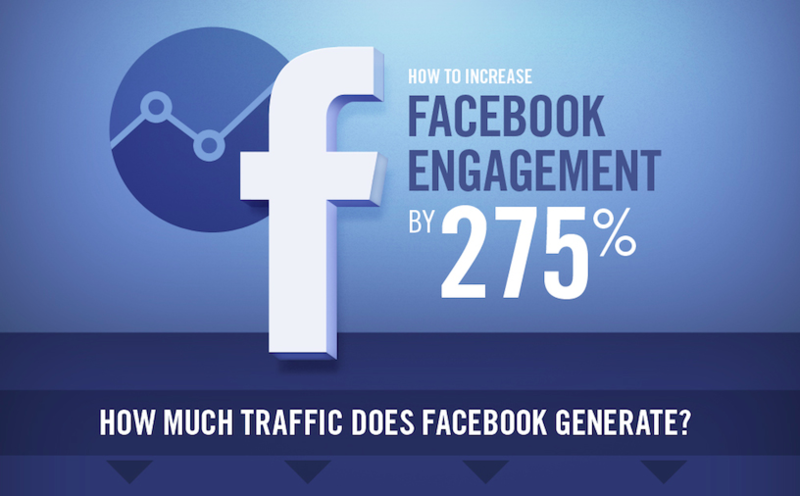 The more exposure your Page gets, the more traffic it will earn. Use Social Media. In order to promote your Facebook Page, consider opening profiles on Google+, Twitter, Flickr and other social networking sites. Tweet or post on Google+ will help your Page audience grow! Promote your Facebook Page in emails. Add a link to your Page to your signature block. This way, each mail you send out will be an occasion to get new Like! Make a contest! It will give you more opportunity for engagement and visitors will be motivated to share your Page with friends. Think of clear criteria the entrants need to meet to submit. Don’t run the contest for more than a week – your fans will want to see the winners fast! If you plan to make a photo contest, set voting to 1 time per day. Fans who participate will get voters to come back every day! Promote your site in Facebook groups which match your niche! If you have a Page for cat lovers, look for groups which gather people with this interests. There are plenty of them and each participant is a Potential Fan of your site! With shorte.st you can monetize links you publish! You can even set up the Shorte.st token on your dlvr.it account to make it automatically. Read our article about how to earn money with Dlvr.it to know more! You can shorten links manually and post them on your Page, you can use Mass Shrinker which allows you to shorten up to 20 links at a time. If the content is interesting enough, people will want to click it. While posting a link, don’t forget to add your comment to it. It’s always a good opportunity to create discussion below the post. Remember that like any job, making money with Facebook is through keeping up the good work. Try our methods and use shorte.st to earn money fast with your Facebook Page!